Christmas has passed and I don't know about everyone else but at least here in the Northern Hemisphere, I think there's probably quite a few people looking forward to some sun. 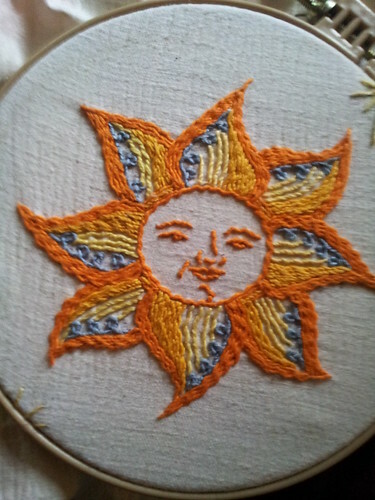 So whilst we're waiting how about stitching up a sun of your own? This lovely pattern by HyJackArt, feels almost a little medieval to me and I like that, you can find it here. It's Christmas Eve and Santa starts his journey delivering treats to good girls and boys. Which list did you make this year? Don't lie...he knows! 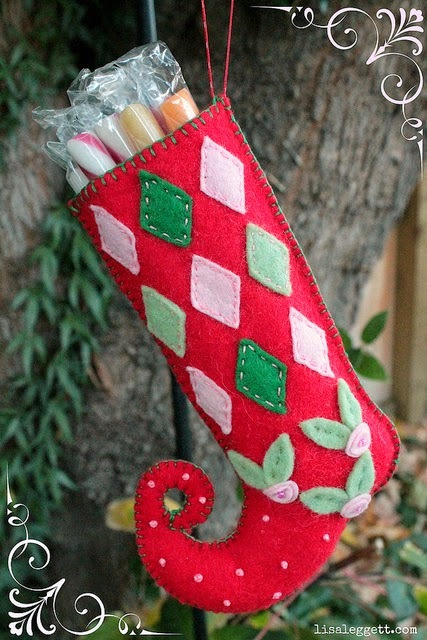 Lisa's Tea Time stitched this adorable little stocking just in case Santa decided to pay a visit to her and her friends. I know Lisa and I'm guessing he is going to be very good to her this year. Let's raise a candy cane to hope, peace, happiness and prosperity on this Christmas Eve and every day of the year. As Santa checks his list one last time, the reindeer are gearing up for their annual trip around the world. Like any long trip, they prepare themselves by packing a few snacks and of course, some stitching to work on while waiting for the big guy to shimmy down the chimney. Snacks and stitching are great, but looking good is very important too. You never know who you will run in! Tana Ferguson stitched up Blitzen looking festive for her voyage. The beads are a sparkly touch to the finished piece. I would love to see how the other reindeer are decked out. I'm sure it is equally as beautiful. At first glance, this looks like your normal hexie quilt. Look a bit closer...see all those patterns? They are blackwork done by Pam Harris of Gingerbread Snowflakes. I am in complete awe of this work. The amount of detail is astonishing. 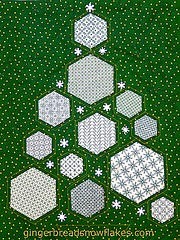 Each hexi is an individual pattern brought together to make a holiday tree. You can see more of the process on her blog. Snowmen make the best ambassadors for winter. They are not here for long, but bring us happiness and smiles. What a perfect reminder to enjoy what we have, for it may be gone tomorrow. 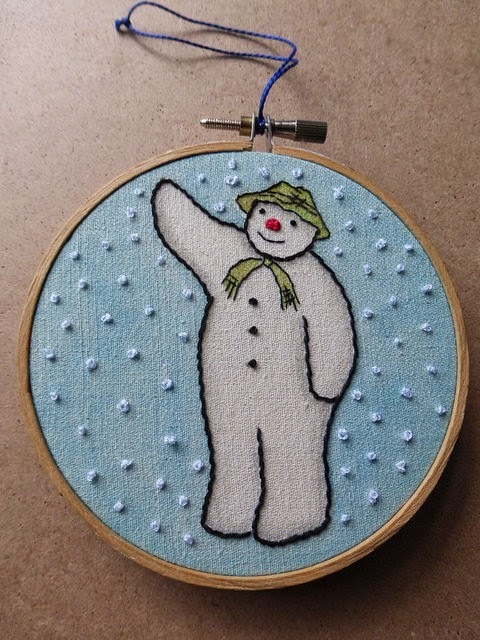 Briarstitch84 has stitched up this very sweet snowman. His background is equally impressive-watercolors on linen. I love everything about this hoop. 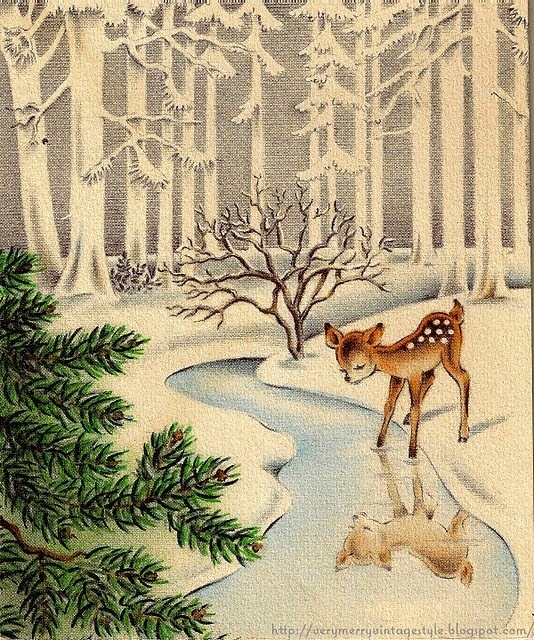 Here's wishing you and yours a peaceful first day of winter. Let's all hope that we can be as happy with snowfall as the snowman is. 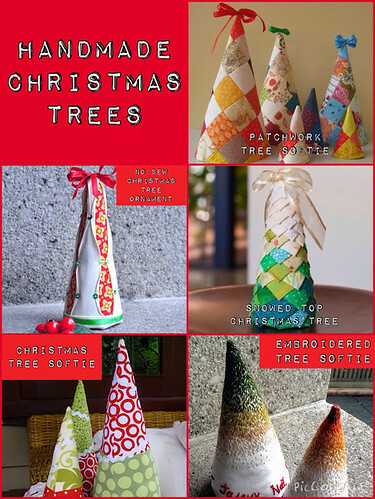 TeresaDownUnder has posted a summary of her Christmas tree crafts she's made over the last few years, I particularly like her patchwork and embroidered trees, check out the link for the how-tos! Countdown to Christmas Day 4: Oh Christmas Tree! The Christmas tree is the focal point of our house. I usually want to get the biggest one they have but my husband's better judgement always reels me in. Each ornament on our tree represents a memory. 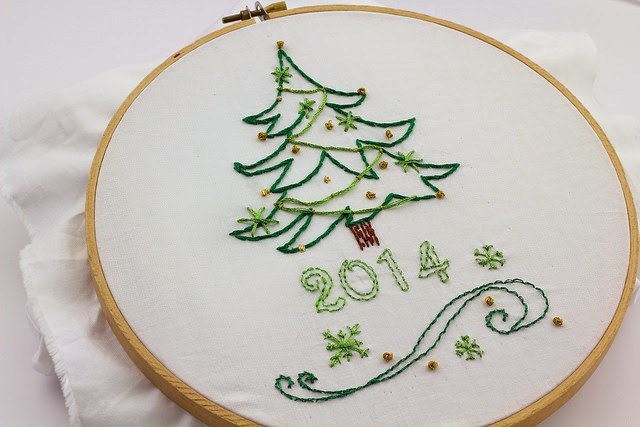 Kim Ouimet has stitched this very sweet tree and the best part-no needles to clean up. It is the perfect little reminder for Christmas 2014. You can read more about the project on her blog and purchase the pattern at her shop. The Leg Lamp...a major award and it's Italian! Kwgronau stitched up the Christmas Story's iconic leg lamp as a prize for her family bingo game. I think I want to be a part of her family. 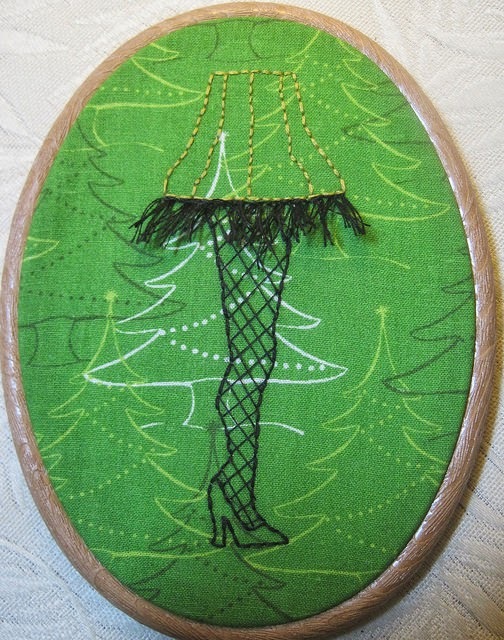 The Christmas tree fabric is the icing on the cake and the fringe is to die for. Don't forget to check out her other creations, she is one talented lady! Mr. Kitty will wear your Christmas sweater, but he won't be happy about it. Oh wait...that IS his happy face. 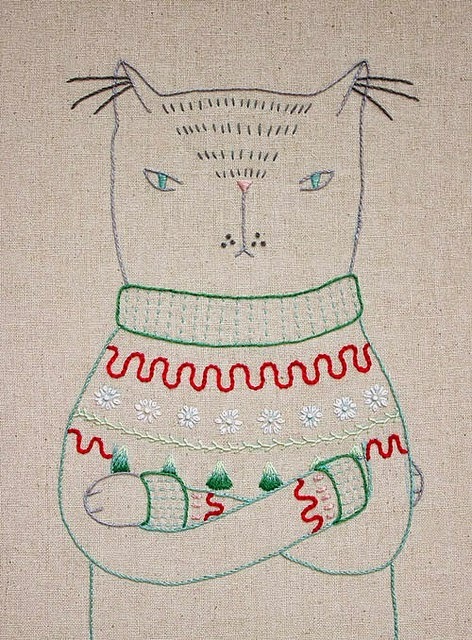 One of my favorite crafty embroidery peeps, Cate Anevski stitched up this adorable, yet slightly annoyed kitty in an ugly Christmas sweater. 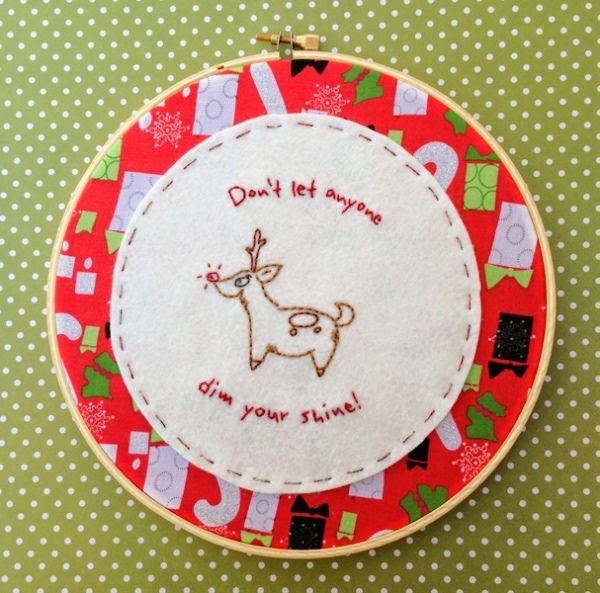 You can make your very own but downloading the pattern and the tutorial on &Stitches. 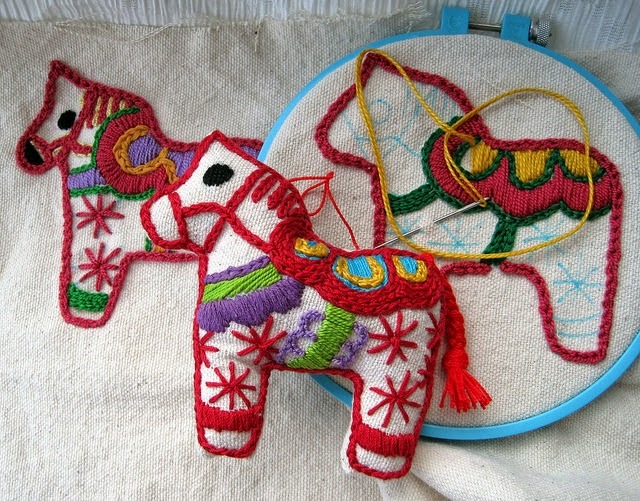 I always associate Dala Horses with Christmas. My husband's heritage is Swedish and we have many Dala horses and pigs in our house. Each Christmas we pull out a box of special family heirloom Swedish ornaments including Dala horses just like the ones from Jacque Davis. These beautiful ornaments hold a special place in my family's heart and connect us to past. Bunnies love to look up at the winter sky and wish upon a star. What is he wishing for...a bunch of carrots, world peace? 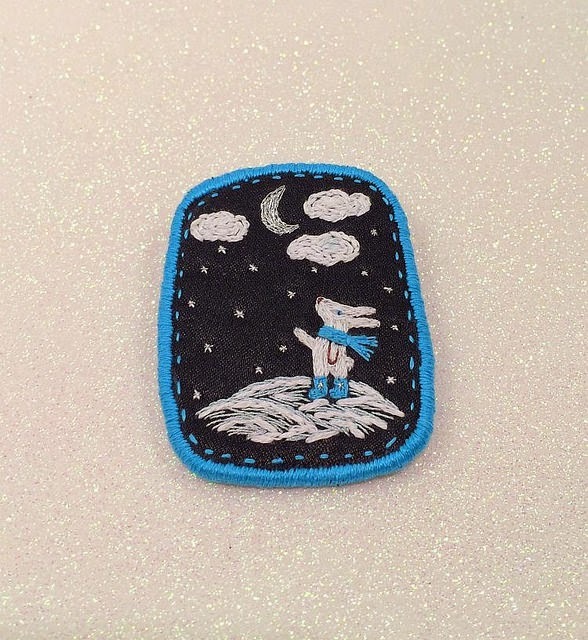 This little brooch created by Makiko_at is so sweet. I just want to jump into the embroidery and give this fuzzy guy a hug. Each piece she creates is one of a kind and in addition to brooches she creates jewelry, ornaments and art dolls. You can see more of her work here. One of the most important things to me during the holiday season is to make sure that I spend quality time with my friends. These adorable Woodland Christmas Friends by Bustle and Sew are an excellent reminder that the best friends are the quirky ones. I am dying over the rabbit with his ear covers. You can see other patterns for sale, magazines and freebies on Bustle and Sews' website. Who doesn't like cute little elves at Christmas? Tell me who and I will give them a bonk on the head! Christmas elves are adorable! Check out this great tutorial by Wendi Gratz if you don't believe me. 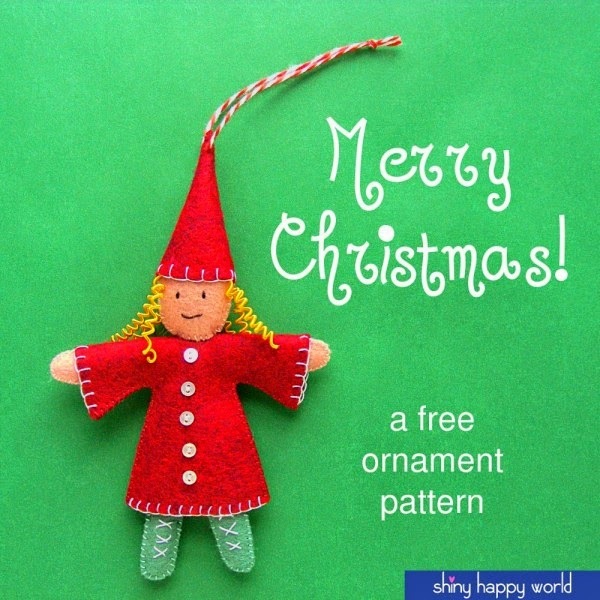 If you are not in the Christmas spirit you can use the pattern for a spring sprite or a summer gnome. You can read more about the post and download the pattern here. 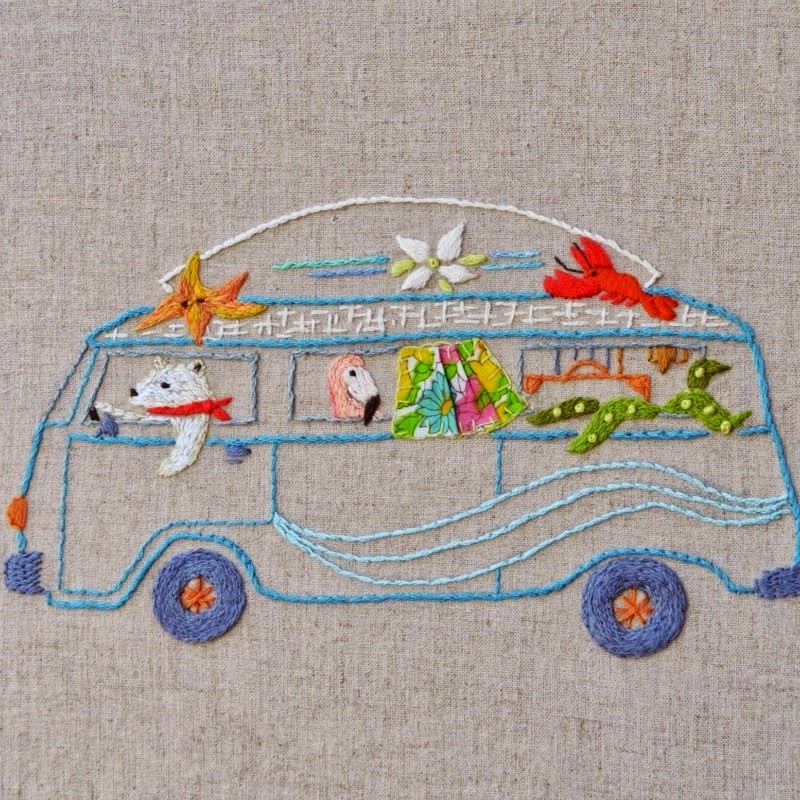 Hands up who's addicted to embroidery .pdfs? I am, there's nothing like a spot of instant pleasure, affordable art and anticipation (of the stitching you plan to do with the pattern), that a good embroidery .pdf can bring. So, I'm very sad to hear that some of my favourite designers have been badly affected by a change in European tax law, that comes in force at the beginning of next year, meaning that, if you're an European designer, selling digital products (such as .pdfs) will suddenly become a hell of a lot more complicated. You can read more about the change in law on this excellent post from What Delilah Did. Nobody has ever become rich from selling embroidery and craft .pdfs, in fact even before this some embroidery designers were shutting up shop, the new ruling makes it even more questionable whether selling embroidery .pdfs is worth it. Reading the recent crop of blog posts has been sad and frustrating, that bureaucracy meant to tackle tax avoidance in large multinationals, is instead going to stifle fledgling businesses. Nicole from Follow the White Bunny is no longer going to sell .pdfs from 31st December, however her shop will remain open. Carina from Polka and Bloom thinks she may have to put up her prices to counter the cost of the extra administration. Sami from Teasemade will also stop selling .pdf patterns on 31st December. Laura from Bugs and Fishes will be removing her .pdf patterns from her shop on 22nd December, as well as no longer accepting blog ads (also affected by the new rules), she will be looking for a VAT compliant reseller and selling her .pdfs that way. So, if you've been eyeing up that Follow the White Bunny .pdf that you never quite got round to buying (Nicole's latest pattern Wave Goodbye is particularly lovely), want to get in on the action on one of Carina's classes or pattern clubs before prices may rise (I love her new Stitchy Souvenirs pattern club) or fancy wanting to know how Laura makes one of her felt creations, or support any of the other talented European designers out there that are selling digital products, now is the time to do it. If anyone knows of any other European designers whose businesses have been negatively affected by this new ruling and I haven't mentioned them, please do leave a comment below. Countdown to Christmas Day 11: Sparkle Baby! Kerry A from Candy Floss Ramparts has a message for you that not only applies to the holiday season but throughout the year. Don't Let Anyone Dim Your Shine is a perfect uplifting message for anyone in your life. I am even thinking about stitching it up for myself! The pattern as well as a tutorial is available for free on her website. There is only one way to kick off a countdown to Christmas and that is with a free pattern from the most awesome Cherry & Cinnamon. The pattern is inspired by the movie Elf and I can just hear Buddy and Jovie singing in harmony with each stitch. 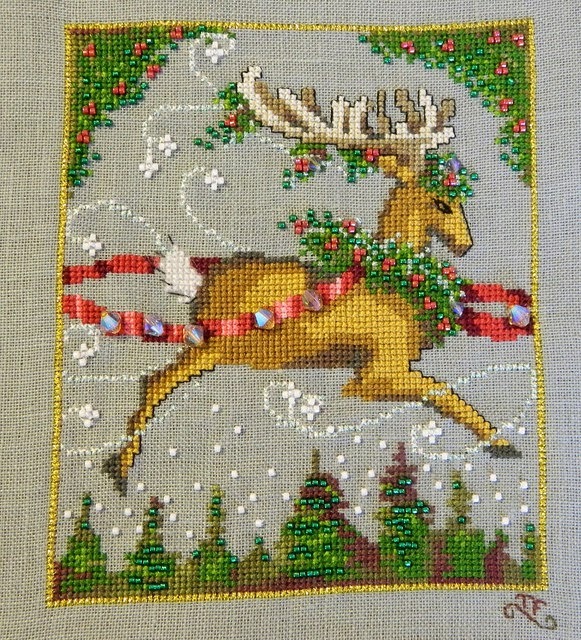 You can download the pattern HERE and don't forget to stop by her blog, Green Geenie. 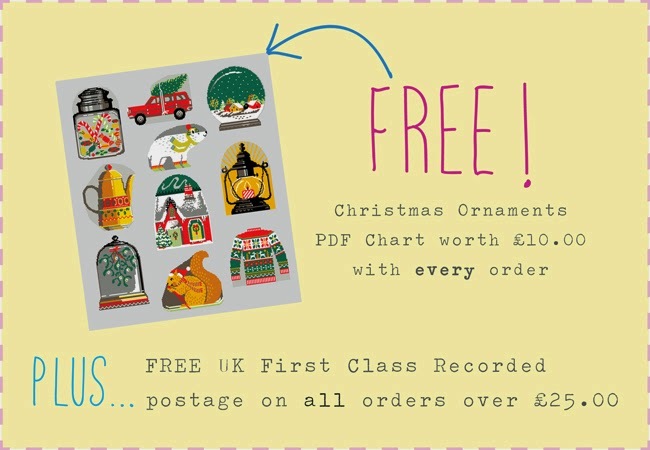 Felicity Hall, purveyor of fine cross stitch patterns, has a special offer on her site at the moment where with any order you get a free copy of her Christmas Ornaments PDF chart. There's lots of goodies in her store, I particularly like her purse kits but if you're overseas (from the UK) and worried about postal times, she also sells some lovely PDF patterns. 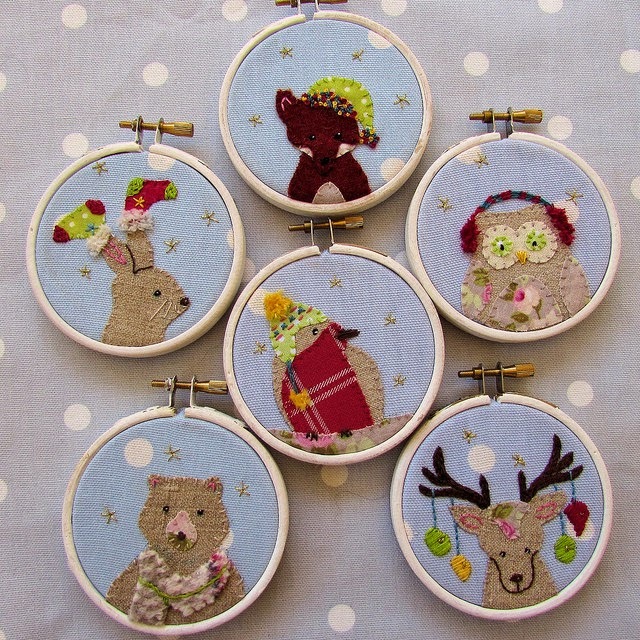 And if nothing else in her shop does tempt you, you can buy the Christmas Ornaments PDF pattern itself for £10. I can't believe that December is already here. I'm not ready! Can someone please tell time to slow down. Another month means another great Craftster Hoopla Along. 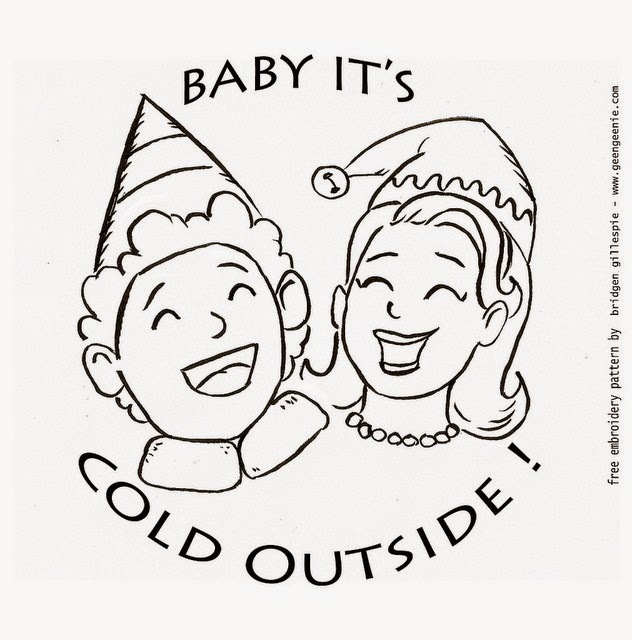 This month's theme is Winter/Christmas/Winter Holidays. Do you dig cold weather? Love a snow day? Are you crazy for Christmas? Having a Happy Hanukkah or maybe a solemn Soltice...whatever the case may be, stitch up your wintery goodness. You might even be the opposite of all that cheer and hate the cold weather-that's cool too, just pull out your floss and fabric and let us know! You have until December 31st to be eligible for a random drawing. The prize this month is a 20.00 Amazon gift card.